Transistors come in many shapes, sizes, and colors. Radios can have as few as one, or as many as fourteen or more. Surprisingly, the transistor count is not always a reliable indicator of performance. 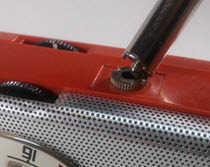 Early radios used sockets so that transistors could be easily replaced. Semiconductors turned out to be so reliable that sockets were eliminated in later sets, primarily as a cost cutting measure. Transistors act both as switches and amplifiers. They are solid state replacements for old vacuum tubes and they revolutionized everything. Their rugged construction, small size and low power requirements all made useful portable radios possible. They also paved the way for computers, cell phones and just about every other gadget we use today. NPN (Left) and PNP (Right). The illustration shows what transistors looks like on a schematic diagram, including the Base (B), Emitter (E), and Collector (C) lead callouts. 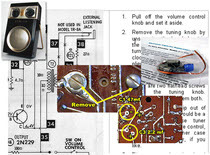 Unless you, or someone else has damaged a transistor by reversing the battery; shorted the base lead with a badly placed test probe; or barbequed the critter with your soldering iron, you won’t need to replace many transistors. Because there are so many different transistor case shapes, there are numerous pinout configurations. Sometimes the base lead is in the center of three leads in a row and the Collector is spaced farther away from the Base than The Emitter lead. Other times the leads are in a triangular layout with the Emitter noted by a small metal tab, or red dot, and so on. Frequently service documentation notes the pinouts. Collect some vintage reference books. There are also numerous vintage reference books on the subject like the ones shown here. It’s worth having a few on your shelf, and they are even more fun to read than a phone book. 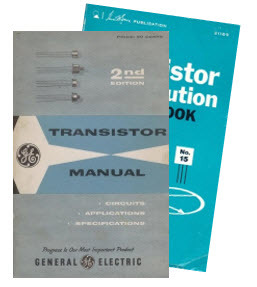 Alternately, there are websites documenting vintage transistors. Find some here. When replacing vintage transistors, I always like to use exact replacements rather than generic substitutes. There are so any variations in specifications—such as leakage, that generic replacements have frequently caused me more grief than joy. Your mileage may vary.